Getting through an encounter in Diablo III will require more than a strong index finger. Blizzard has updated its Diablo III website with new details on how players will have to go about destroying legions of monsters in the series' third entry. Earlier Diablo titles were all about the mouse click, and Blizzard isn't necessarily changing that, but wants to make you think a little bit more about those clicks in Diablo III. Blizzard writes that it wants to make monster encounters "more tactically interesting" than in previous games, but without sacrificing that fun, quick Diablo feel. There are two techniques Blizzard is using to do so. The first is through diversity. Blizzard says it's implemented a "malevolent throng of new, more diverse monster types" in Diablo III. A big room of monsters in Diablo used to mean clicking on all of them as fast as possible, perhaps taking out the ranged enemies first. 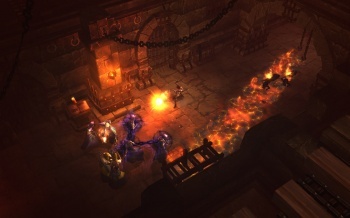 Diablo III will require much deeper choices in regards to the order in which monsters must be dispatched. Secondly, Blizzard has categorized every enemy by its unique behaviors, instead of its type. One category is called "big hit," and includes enemies that will make "very telegraphed, obvious, and often slow attacks that do a great deal of damage if they hit you." As an example of how all this comes together, Blizzard talks about the Vessels, human cultists that are in the process of being possessed by a demon. Allowing Vessels to live for too long will result in the creation of much more violent enemies. When enemies like Vessels exist on a battlefield also filled with a mass of Fallen (similar to Imps), Sandwasps firing slow moving but high damage projectiles, and a seemingly invincible Dune Dervish whirling his blades around willy-nilly, tactical choice is of the player's utmost concern. Players might have to use the environment to keep swarms of enemies around them to a minimum, and think about defensive skills just as much as offensive skills. It might not be as much fun to use earned experience to improve your armor's toughness over the strength of your bombs, but it's necessary for survival. A cow may no longer be simple click fodder in Diablo III.